Today wasn't really of any interest at all because we spent it mostly on motorways just gobbling up some of the miles that will bring us closer to home. However, after about 5 hours of travelling we'd both had enough so we broke our journey near the town of Workum and stayed on a free but muddy camper stop where we were greeted with great enthusiasm by the owner. 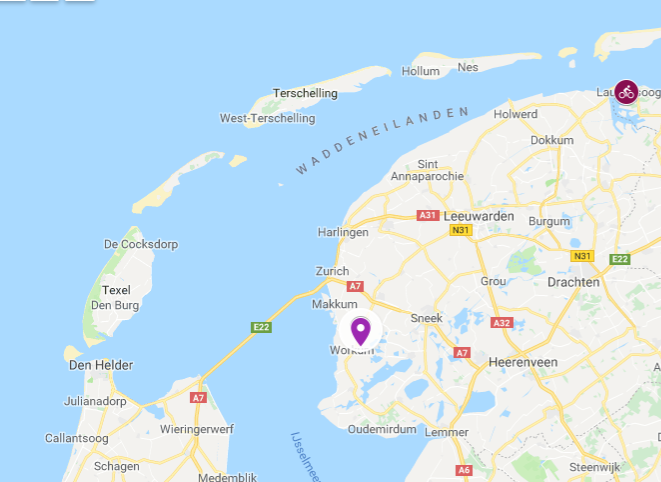 Our initial plan had been to stay there for two nights so that we could cycle over the Afsluitdijk (barrage) but we quickly realised that would be a round trip of about 50 miles which was a bit to far, so instead we moved on and drove across it on Thursday ! The Afsluitdijk which is 25 km or 15.5 miles long with 2 car lanes and a cycle track + several viewing points. Well the highlight of today's trip was the magnificent Afsluitdijk which encloses the Ijsselmeer (lagoon) on one side - thus protecting the Dutch lowlands, and which is washed by the Wadden Sea on the other. On the dyke itself we stopped in an area called Breezand, and as well as appreciating the fantastic views, we also learnt about the history and construction of the dam which was the brain child of the engineer Cornelis Lely back to the late 1800's. However, initially things never really got off the ground and it took a massive flood disaster in 1916 to spur the project along. In 1918 Lely's plans started to be implemented, but even then it took until 1927 for the work to begin on the closure between Den Oever on one side and the village of Zurich on the other. The Afsluitdijk was officially opened on 25th September 1933 by Queen Wilhelmina but by then Cornelis Lely had died (in 1929) so he never saw the completion of his project, but a statue of him was erected in 1954 so for time immemorial he well watch over it. And it is thanks to the dam the sea has been kept away from the low lying lands in this part of the Netherlands for over 85 years, but now it's been decided that the Afsluitdijk doesn't meet current safety standards because the cladding is't strong enough and it also isn't high enough if a severe storm was to occur. Therefore, in the near future reinforcement work to the cladding is planned, and also strengthening of the locks and discharge sluices, along with the instillation of powerful pumps that can move water from the Ijsselmeer to the Wadden Sea at a rate of 400 - 600 cubic metres per second - which is a similar capacity as 12 Olympic size swimming pools! From there we continued a short distance to a small campsite near the Boekel Canal and from here we'll visit the town of Alkmaar tomorrow. Today we left T4rdis2 and toddled off on our bikes to visit the famous Alkmaar Cheese Market which can trace it's history back to 1365 and which happens every Friday from March to September. 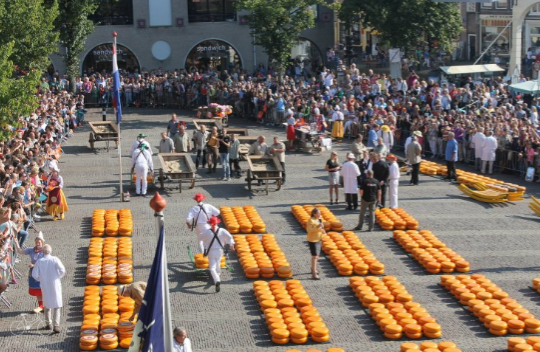 It takes place on the Waagplein (the main square in front of the Cheese Museum) and it opens to the public at 10am, but before that the 'Kaaszetters' start putting the cheeses out so that everything is on display by 9.30. The Cheese Father then gives a talk to the cheese carriers and at 10am a bell rings to indicate the start of trading. Then the samplers and traders go to work inspecting the exterior of the cheeses, knocking them and also tasting them with the use of a special cheese scoop which obtains a small chunk that is crumbled, sniffed and tasted to assess the percentage of fat and moisture. The cheese is also cut to inspect it for holes which are also known as eyes - a perfect cheese has eyes that are evenly spread throughout - apparently if a cheese doesn't have eyes it's know as a 'blind cheese' and is considered to be of inferior quality. Next comes price bargaining and this is still done by clapping one another's hands and shouting prices - the last clap clinches the sale of a batch! Then once the deal is closed the cheese carriers use a 'barrow' to take the sold cheese to the 'Waag' where it's weighed in the Waaggebouw! Once the batch is sold the cheese carriers carry the cheese across the market to the buyers lorries, and this is done via a barrow that they hang from their shoulders thus allowing them to carry 8 cheeses at a time. However each cheese weighs 13.5 kilos and the barrow weighs about 25, so altogether they carry 130 kilos - and they don't walk - they dribble! A sort of trotting pace where they step out of time with each other to ensure the barrow hangs as still as possible. Think this might be an easier way to carry the cheese! Finally the official part of the market ends very promptly because the entire square must be emptied of cheese before 1am so that the cafes can set up their tables and chairs - however the stalls all around the sides continue their trade for a while longer. But by 1pm we'd had enough of the huge crowd where it was only possible to move at a shuffle - when we'd arrived several hours earlier we'd even had difficulty finding somewhere to park our bikes because every spare inch of pavement that wasn't covered by a market stall, a person or an already parked bike, was already taken - we even looked for a 'builder or two' but there was non to be found! As we left the market we pottered through some of the main streets of the town that were filled with buskers that included a loudly playing street organ. But as usual, we didn't stay much longer and we were quite happy to go and find a quite spot by one of the out of town canals for our late picnic lunch. Saturday 15th and Sunday 16th September 2018 ⛅⛅⛅⛅⛅⛅ for both days. On Saturday we moved back to Groene Hart Camper Plaatz where we've stayed before (and here), and this has put us in a good position for catching our ferry back to England on Monday. We know this lovely area quite well now so we've spent our time just pottering about the canals and lakes on our bikes or sitting outside in the sunshine chatting with our neighbours. We're amazed really because after spending nearly 5 months on tour this is the first site where we've found fellow Brits! At least we weren't competing with the peleton! Our ferry tomorrow isn't till 2.30pm so we'll be in no rush to leave, and that's probably a good job because as it will be a long day I've promised John a cooked breakfast - and after that it will be a slow drive to the Hook of Holland for our departure! 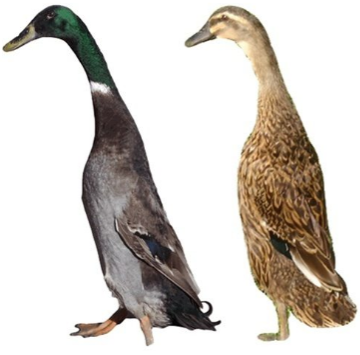 So after 135 days away and our 7.5 hr ferry crossing we'll be popping up somewhere in England, and a few days after that we'll be back on our favourite site at Swanwick were we'll be resuming our role as Duck Wardens - but as we're very partial to duck eggs that will be a welcome task!